This mega bundle contains all of my best sellers and a lot more with a huge saving! These templates have sold tens of thousands of times and have helped all kinds of designers and entrepreneurs over the world. Help speed up your projects and save time & money! 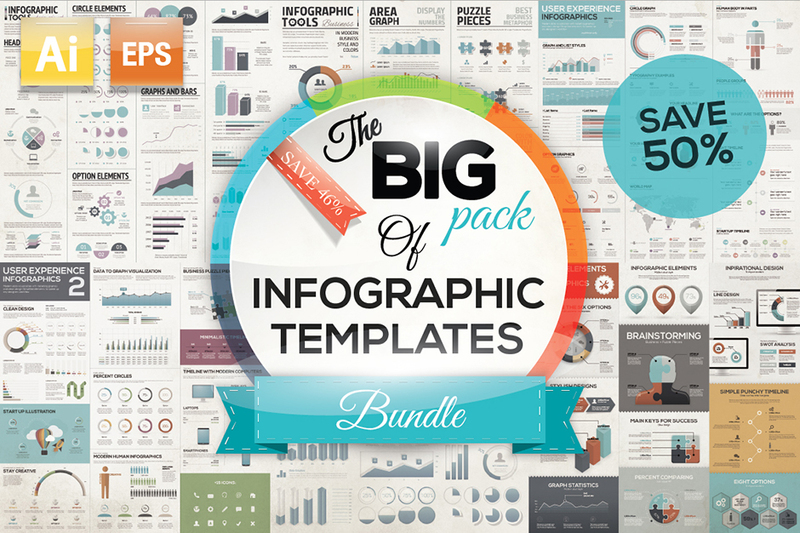 Now you can get these best selling infographic vector template elements in a 5-set bundle. Hundreds of stunning vector elements and templates to help you to get your design projects ready in minutes. Please note that text areas are editable in .AI files, but not in .EPS files. However you can easily add new text areas. • Updated: Get also all 5 sets now as brochure styling. 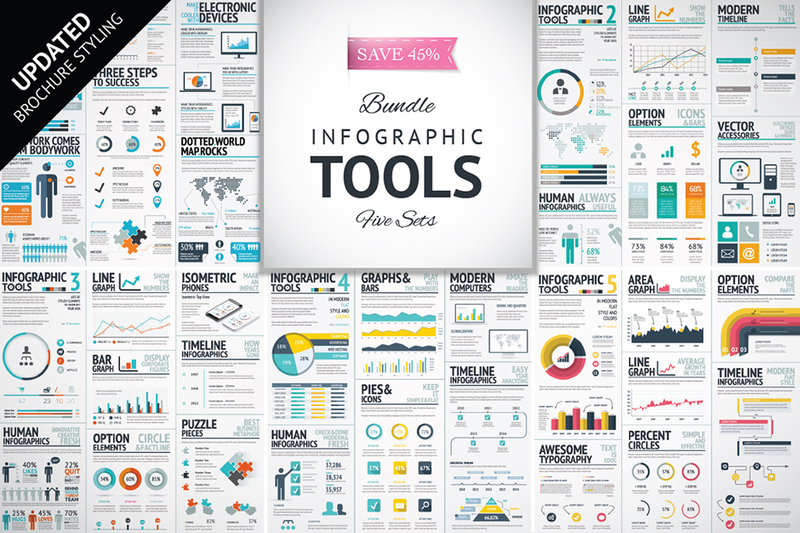 This bundle contains 100’s of modern vector elements to create infographics fast. You can also use these graphics for any other data visualisation projects. 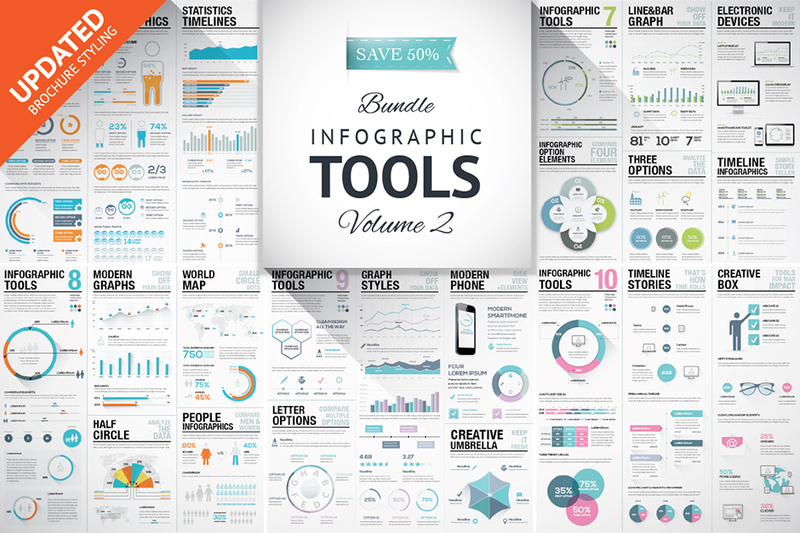 I’ve created lots of different graph styles, pie charts, timelines and creative elements to make this pack a great value! All elements are 100% vector files created with Adobe Illustrator CS6 so you can resize them without having to worry about losing quality. 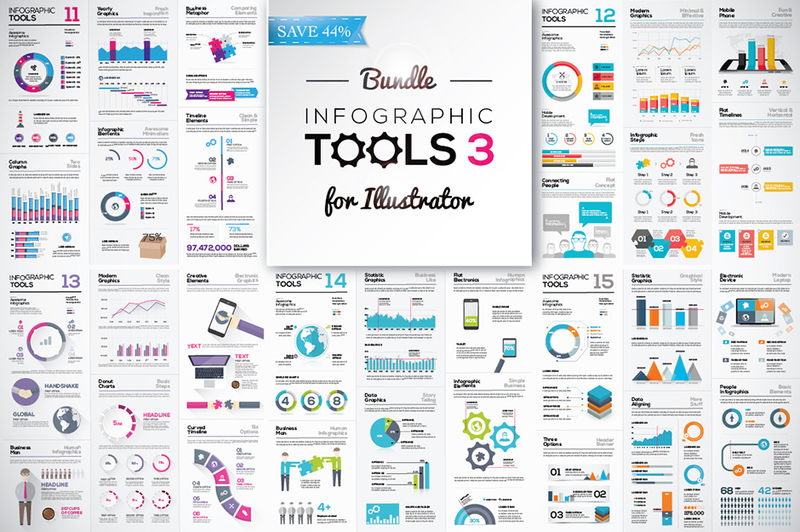 This bundle includes five collections that contains lots of different graph styles, pie charts, timelines and creative elements. All elements are 100% vector files created with Adobe Illustrator CS6 so you can resize them without having to worry about losing quality. Text areas are editable in .ai files, but not in .eps files. However you can easily add new text areas. 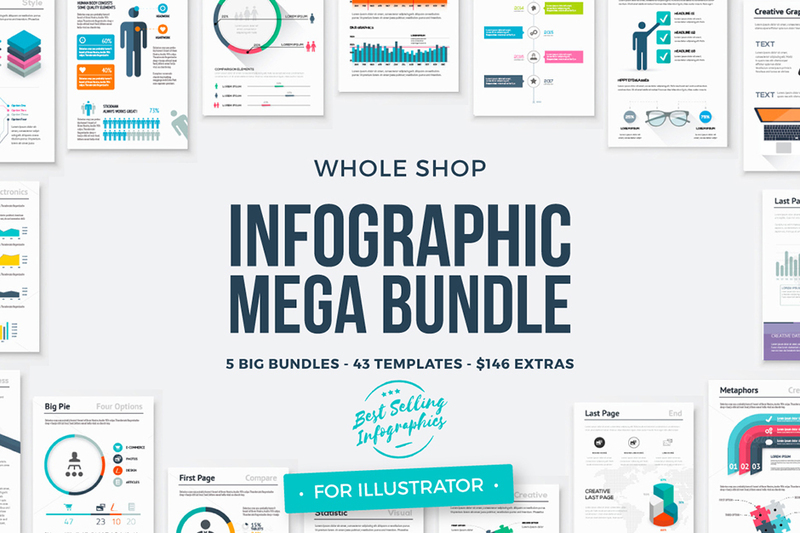 My last infographic template bundle skyrocketed so now it’s time for another bundle! This is a stunning collection of the highly popular infographic vector element sets. All sets contains hundreds of elements already by themselves and now as a bundle you’ll get 1000+ vector elements. Check 2nd preview image to have a clear vision of what I mean. These are fully editable vector files saved as .EPS10 and .AI CS6. Rescale to any size. Text areas are editable in .AI files, but not in .EPS files. However you can easily add new text areas. 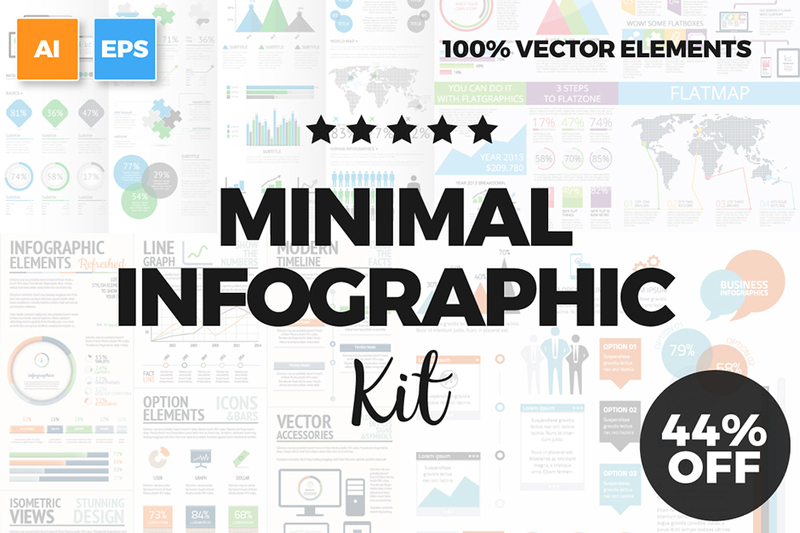 Hundreds of vector elements to build up your own infographic in just minutes. These are fully editable vector files saved as .EPS 10 and .AI CS6. Rescale to any size. Text areas are editable in .AI files, but not in .EPS files. However you can easily add new text areas. Software compatibility: Adobe Illustrator CS5 and newer..EPS files will work with graphic software capable of handling EPS10 vector files. File size is approx 833.3MB (1.55GB unzipped), offered as a single download. I like the infographic vector images. It is practical and useful!! How long will the current Infographic bundle be offered? Thanks for the comment on this one! So this is in our marketplace which works a little different to our bundles. Our marketplace items don’t have an expiry on them which means you can purchase them whenever you like, unlike our 2 week bundles which, once they expire, are finished. You also have the option to build your own bundle in the marketplace and with this option, you can save up to 50% off the listed price :). I hope that helps and please do let me know if you have any questions! Hey there! Just confirming that all of these sets are compatible with Adobe Illustrator CS5? I have yet to update to CC and would hate to download something that I cannot use to its full capacity! Can we have the pdf guide with this bundle please ? I am so sorry to disappoint you but our PDF guides only come with our bundled deals and not with our Marketplace items. I will definitely suggest this to the team to see if this is something we can look at doing in the future though! For the charts etc are these set up as Illustrator charts? ie. is it possible to just update the figures and it will regenerate the charts? I am really sorry but I’m afraid that the charts in this mega-bundle do not auto-update when new data is entered. They can certainly be edited to reflect your specific data but this would be achieved manually. I apologise for any inconvenience caused! I hope this helps, Alice, and please don’t hesitate to contact me should you have any other questions. I’m always happy to help! Any video or snippet showing how these work? I’m relatively new to DesignCuts. Can anyone tell me how these work? Are they graphic styles you substitute your client info for and viola!? Want to make sure the info is conveyed in the right amounts, etc. without having to just ‘eyeball’ it. Anyone, anyone? Looks like most of these show some little video snippet of how you edit them. Did I miss a link per chance? Had to have. I work with data analysts all day… It must be rubbing off.